Susan Adams Moffett shared this piece below on Facebook recently. Her sister Lisa died from cancer just a few years ago. 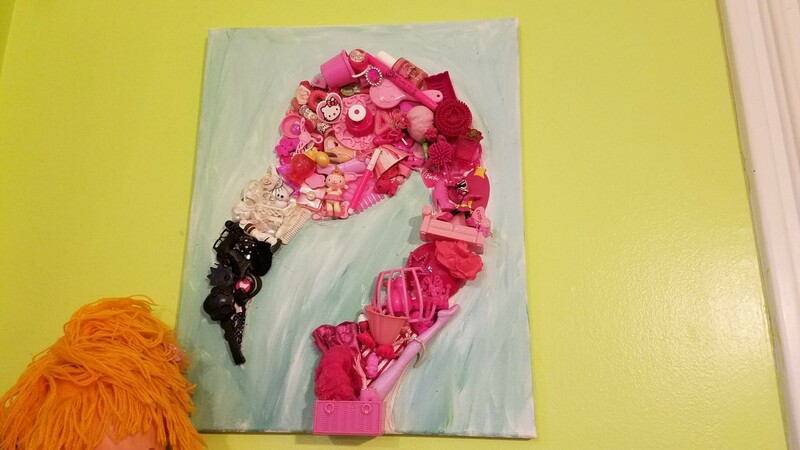 She wrote about that in her book “My Sister,Her Cancer, and the Cross.” She says “This is the story of walking the journey of my sister’s cancer…but it’s more than that. 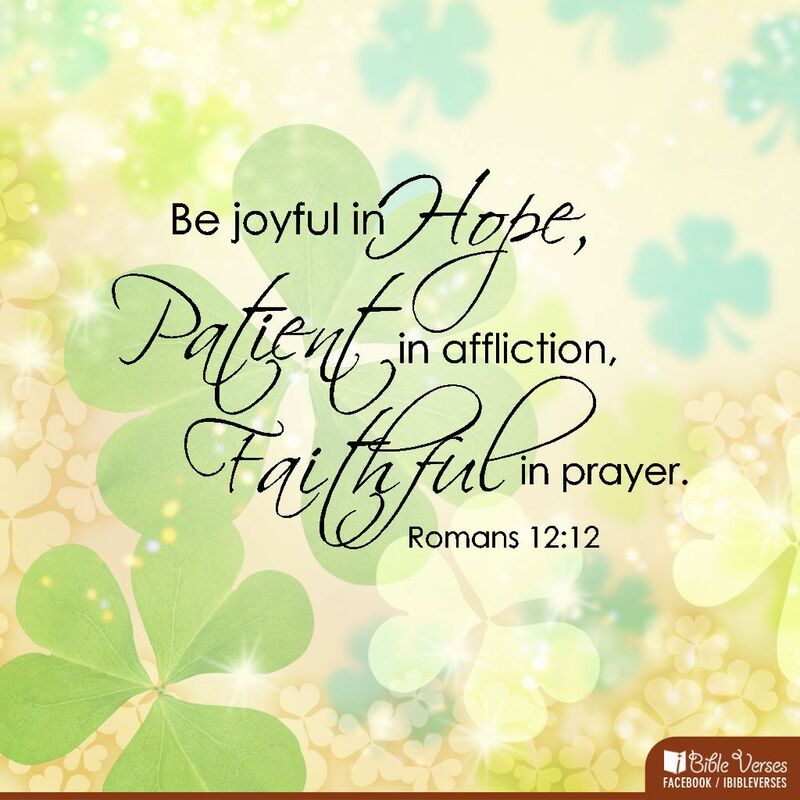 This is the story of God’s grace because my faith is weak and imperfect, but He is so good.” I found what she wrote in the article below to be very meaningful. I hope you do as well. But I knew that scriptures couldn’t be wrong. I felt like something was missing in my understanding. Maybe I was grieving wrong. Maybe I had to work harder to get over it. Maybe I didn’t believe enough. Maybe I wanted to hold on to the sting because it’s all I had. Then I read the story of Lazarus for the 378th time. But it was like for the very first time. In that moment, I heard and understood. Death had no hold on Lisa. That brings sorrow and loss and grief so deep. But death has no hold on her. Death has no sting to it. It is powerless! Lisa isn’t here. Most of my grandparents aren’t here. Several dear friends aren’t here. They are all fully alive! More alive than they ever were here. Maybe today you have a sting. Let’s walk this week towards the cross, watching, looking, listening to the work of Jesus. We have to walk this week, so we can deeply celebrate Resurrection Sunday. Ya’ll have a Blessed Holy Week! Oh my, could the title above be any longer! I started off writing about passing out and then lots of other things started pouring out in my writing so here it is! Saturday before last I ate a good breakfast, three homemade blueberry muffins, water, and coffee. I went outside to plant more of my precious little sprouting vegetables in the main garden. I was sitting on a small stool so there would be no bending over and mostly so I wouldn’t resort to sitting my but in the dirt while planting. I began feeling lightheaded but since I was just sitting I figured it wouldn’t get worse. It did. I went to get my phone out of my pocket to call for Roy and had difficulty doing that. I got it out and called Roy. He didn’t answer. I called again and heard him come out of the house saying he was on the phone with someone about $2000 being charged to our credit card fraudulently. I dropped the phone and things are foggy after that. I heard through the fog that he told the phone caller we had a medical emergency and he’d have to call them back. I don’t remember how but I know he got me to a nearby chair and he put a cold towel over my head. Roy later told me that while sitting sprawled out in the chair I passed out with my eyes rolling back in my head and that lasted a while. The eye rolling back thing happened when I had to be rushed to the hospital two years ago because of a bleeding ulcer. Both times this scared Roy a lot. I don’t remember getting inside but I know that I stayed in bed for a long time that day. Roy took my blood pressure and it was low for me at 90/50. I take blood pressure medicine, Avapro 300 mg once a day. I’ve taken it for 20 to 25 years and it always keeps my blood pressure at 120/80 which I have always been very happy about. This was the first time ever that I can remember that it has been low. Because every time I go to any doctor or hospital my blood pressure is always perfect I never attribute feeling bad to low blood pressure so it’s never been taken at that time, before Saturday. Sunday I still felt bad but not nearly like Saturday. My blood pressure was more normal each time Roy took it. I never thought to stop taking my blood pressure medicine, duh…………. I love, love, love this song! Roy “allowed” me to go outside in the garden for no more than 30 minutes at a time and then had to stay in bed or on the sofa for a while after that. He helped me more than usual with the gardening and it allowed me to get more done with less effort. He’s kinda good like that! He knows I usually prefer to handle it all myself but he pitched in when needed. All of the remaining vegetables were planted and today they are all so happy and growing beautifully. Last Monday when I contacted my doctor he said for me to stop taking the blood pressure medicine for two days, drink 6-8 glasses of water and take my blood sugar and blood pressure often. Being the brilliant lady with dementia that I am, I took my blood pressure medicine Monday and Tuesday because I forgot I wasn’t supposed to. Anyway, I made a sign on fluorescent pink paper that said to not take my blood pressure medicine so on Wednesday and Thursday I didn’t take it. My blood pressure has been fairly normal both days. This medical event sent my dementia into a tailspin. Last Wednesday I was, however, able to have a nice visit with our pastor, Bro. Avery, down by the pond and I was thankful for that. Later I realized I bounced all around in our conversation and told him things he may not have wanted to know (!) but he didn’t run off which I appreciated! The last few days I’ve worked in the yard pulling weeds and moving some vines from one location where they are plentiful to another location that needs them, planted carrot seeds, pulled weeds and lots of other things outside. As long as I keep it under an hour I seem to be okay and don’t see any signs of possible passing out! 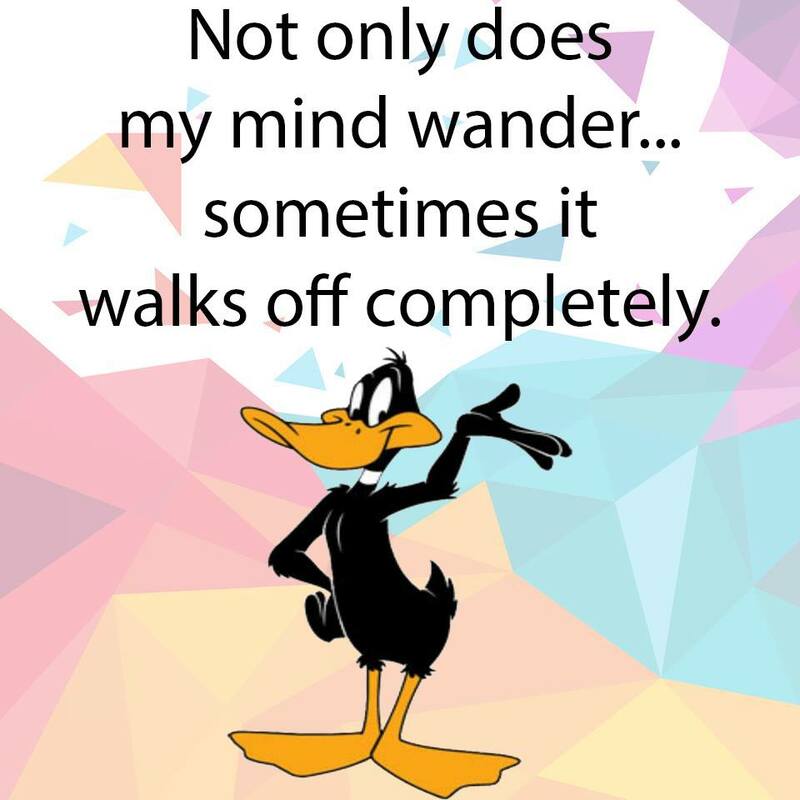 On one of the dementia facebook groups I am a member of I asked if others with dementia had issues with passing out from low blood pressure when they’d never had that before. All those that responded said yes and that it was caused by a change in their brain that made the blood pressure medicine not work in the correct manner any longer. Time will tell if this is a new brain thing for me or if it is something different. It’s been normal every day so for now being off my blood pressure medicine seems to be the thing to do! We are having our daughter in law Misty’s family over for a picnic on Easter next Sunday and we are really looking forward to getting to visit with them. I’ve stuffed candies into plastic eggs for an Easter egg hunt and just finished wrapping the utensils in Easter napkins with homemade decorated paper napkin holders. I love having family visit and also love these events because I do special cleaning so they don’t think we live like slobs!! I gave to several of the kiddos at church one of my painted rocks that have 1 Cross + 3 Nails = 4 Given painted on a cross. I asked them to hide them to help share with others about Jesus. On Sunday our adult choir at church sang a beautiful Easter Cantata titled Jesus, Only King Forever. I always love hearing them sing and especially Easter and Christmas music. Roy’s eye surgery to remove the spidery floater is back on and will be this Thursday, the 18th in Baton Rouge at 9 am. Please pray for him and his doctor, Dr. Robert Mason. We’ve had some magnificently beautiful cool sunny days here in Louisiana recently. So thankful for a God that provides us with days like this! Many of ya’ll will remember Roy’s eye doctor issues last year. The doctors said Roy needed a good pair of eye glasses to see if they would help with the various lingering vision problems. Our new health insurance, People’s Health, covers eye glasses so we found a doctor in Amite, Dr. Wroten with Bond & Wroten, whom we visited to have our eyes checked. We both liked him and ordered bifocal glasses. Since having my cataracts removed a few years ago my vision has decreased a bit so glasses have made a difference for me. They have made a difference for Roy also which we are very happy about. Since it seems that one doctor visit for us always leads to another different doctor visit this one did also! While Roy’s eyes were being examined he told Dr. Wroten about a spidery looking floater that’s been in his eye since the original surgery. 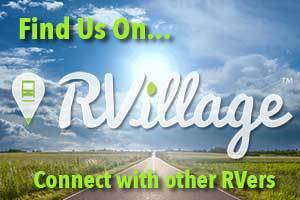 Dr. Wroten recommended Roy see Dr. Robert Mason in Baton Rouge who specializes in vitreoretinal surgery with the Retina and Vitreous of Louisiana. Roy saw Dr. Mason who agreed the spidery looking floater needs to be removed and surgery was scheduled for March 14. Before the surgery Roy had pre-op tests and visit with our primary care Dr. Hugo Valdes to get clearance for the surgery. Blood work done at Quest was fine but the EKG done at North Oaks as usual showed Roy has extra heart beats but this latest showed more extra heart beats. This is called premature ventricular contractions (PVCs). Because of the PVCs Dr. Valdes wouldn’t clear Roy for surgery until he was examined by a cardiologist. 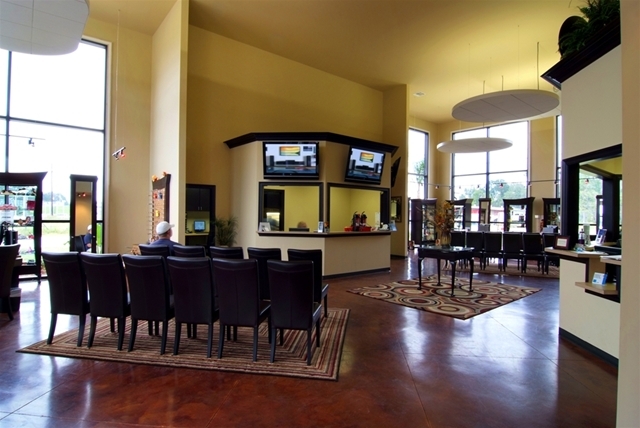 He recommended Dr. Georges Khoueiry with the Heart Center of Hammond. We saw Dr. Khoueiry who ordered a nuclear stress test and an Echocardiogram. Those tests results were abnormal, possibly showing blockages. The eye surgery was postponed at that point and an angiogram was scheduled. If blockages were found Dr. Khoueiry would put in stents. Roy had the angiogram this past Thursday at the Cardiovascular Specialty Care Center of Covington. Our son Chip, my sister Harriett and brother in law George were there with me. Roy came back with good news that no stents were needed. A slight blockage was found but not enough to need a stent. Yay! But there is still the premature ventricular contractions issue, so now we go back to Dr. Khoueiry on Friday, April 5th to look further into why Roy has these extra beats. Just came back from Dr. Khoueiry’s office. He gave Roy clearance to have the eye surgery. He did not prescribe anything for the extra heart beats because they haven’t affected Roy’s heart. He did prescribe cholesterol medicine to help keep the slight blockage where it is and not get worse. Sometime this year Dr. Khoueiry wants Roy to have a halter monitor to further check his heart beats. Back to Dr. Mason now for the eye surgery. For someone like Roy who detests going to the doctor you can imagine how he feels about now. He’s now seen 6 different eye doctors over the last two years. Hopefully when this is over, Dr. Mason will be the last! Okay, so the garden is doing some odd things and I’ve made mistakes. Some things are going really well and I’m learning! Again, not a blog post everyone will want to read but here it is! I just read it through one last time and it really is not tantilizing! I wrote about my rock painting at the bottom so if you’re interested in that and not the gardening, skip to it! At first I plated three garlic cloves inside with their papery shell on them and they sprouted, then transplanted them outside where they are growing well. Then I planted several cloves directly into the garden outside without the papery shell on them. After a couple of weeks wondering why the second batch wasn’t sprouting I decided to watch a video about growing garlic. I’ve watched several videos about growing garlic before but somewhere along the way my brain threw away what I learned and went with some alternative. Two of the peeled cloves are now sprouting so we’ll see how this goes as time goes on. Garlic is a long growing plant and won’t be ready until early fall so stay tuned. 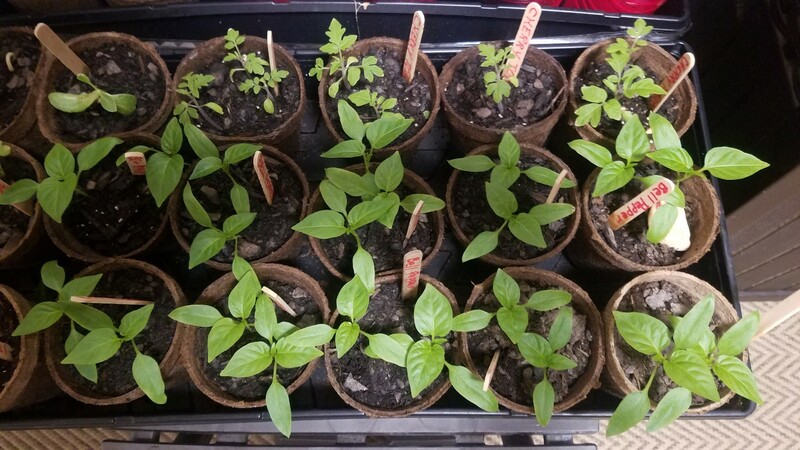 The rest of the other vegetable seeds that have sprouted were going through the hardening process I mentioned in the last post. 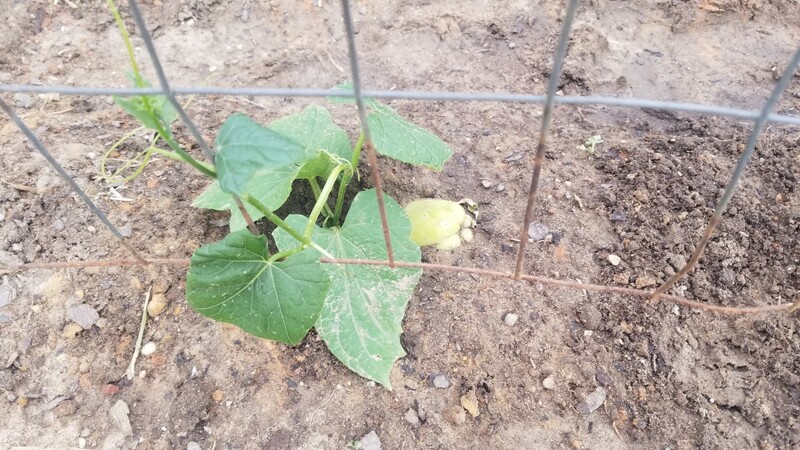 Roy feels like they aren’t as big as they should be at this point considering the seeds were planted two months ago. These include the cherry tomatoes, big tomatoes, bell pepper, cauliflower, broccoli, lettuce, okra, chives. We found a four shelf hard plastic shelving unit at the local junk yard on Highway 16 and purchased some very low cost LED plant growing lights. Roy put it all together and its now in the “rock painting” room where the grow light is programmed to come on at 6 am and go off at 10 pm every day. That was just a few days ago so we don’t know yet how that will go. I planted two cherry tomato and two big tomato plants from the “rock painting” room into the garden today to see how they will do there compared to staying inside under the growing light. Three of the five cantaloupe sprouts growing down by the pond died. 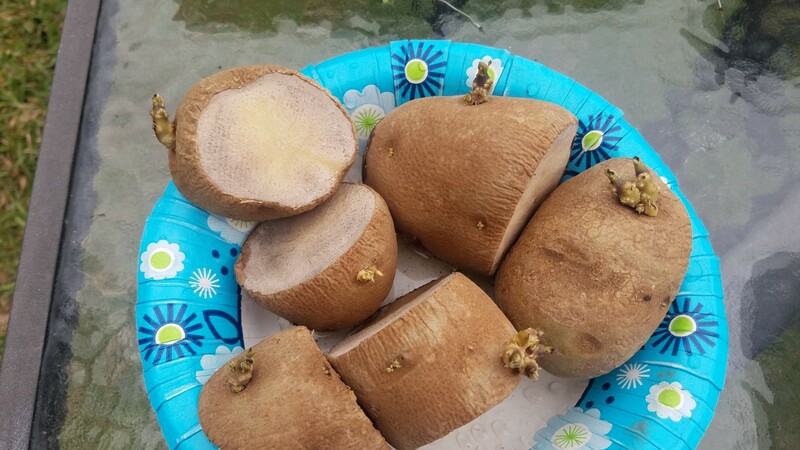 I bought another cantaloupe, scooped the seeds out and dried them for several days. Last week I put all of them in the three plantless mounds. We’ll see how that goes! There is a 4 x 20 patch behind the blueberries that I’m thinking of experimenting by sprinkling more of the cantaloupe seeds there under the leaves. After the last two nights of 39 degrees its all beautiful warmer temperatures ahead. 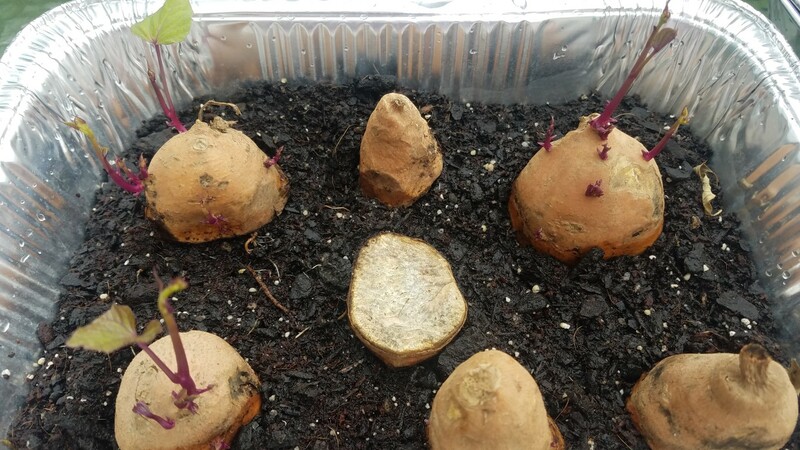 Sweet potatoes are doing really well but the vines are not quite at the point where they can be split from the sweet potato yet. I did some research and since they can be put out in the garden as they are now I did it to day! Three have nice vines and a couple have tiny vines but they all went out. Lots of mulch put around the tender sweet potatoes. Bell peppers are doing really well but like the sweet potato they could go outside so I put four bell peppers (of the 20 total plants) out in the main garden to see how they do there. It’s a risk but I have exhausted my supply of patience waiting! The rest are patiently waiting under the growing light. Lettuce, chives, broccoli, cauliflower were struggling and I’m hopeful the grow light will help them get to where they can go back outside for hardening. The five original watermelon sprouts planted down by the pond are doing well and look very healthy. The seeds I planted down there last week are beginning to sprout. A bunny or something ate the tops off of most of the brussells sprouts. The tiny brussells sprouts are still there and I’m going to leave the plants there to see if the sprouts grow bigger without the leaves. The yellow onions planted in the main garden and the pond garden are all sprouting. All of the corn seeds have sprouted and are between two to six inches high now! All of the original potato plants are very healthy and growing well. The second batch of potatoes that were planted a couple of weeks ago are not coming through the soil yet so I don’t know how they will do. I piled pine straw on top of the militons and cucumbers and they are growing well now. Only one of the five militons hasn’t sprouted yet but the others are doing really well and are attaching themselves to the fence Roy built. About half of the cucumber seeds I planted are sprouting. They are not tall enough to reach the fence yet. I piled pine straw on top of the garlic, yellow onion, white potatoes, corn and four tomato plants that were just planted this week. 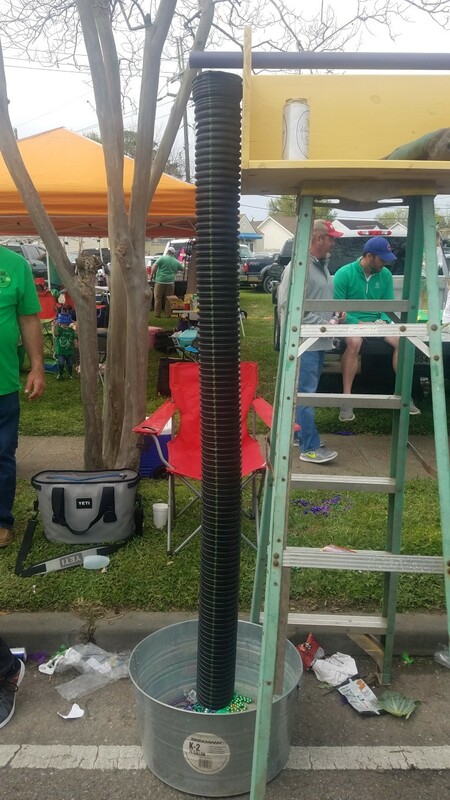 It should help especially when the summer heat starts here in Louisiana and the ground gets dry easily. The peanuts along the fence near the front road are all growing and have a few leaves already. The peanuts down by the pond are not growing yet. One has sprouted but more should soon. I have had a bad chest congestion and coughing for the last few days. Roy was sick with it before me. Tried my best to say in bed and I succeeded a bit. I want it to go away, doesn’t everyone when they are sick! I’ve been rock painting since I can just sit still while painting. I have a bunch ready to go out and a bunch more on the work table getting ready for Easter. The ones that are ready. The big blue M&M rock was hidden today in Kentwood. I love the M&M rocks with a chunk taking out. They are quirky and I do a few large and small from time to time. This is a new phrase I’ve started writing on my rocks. I think that saying will make anyone who reads it think about God for a minute which is the whole idea. The second are a bunch that are ready to out. If ya’ll want to contribute some 3 to 6 word evangelistic or just cute phrases that would inspire or make someone happy please send them to me as a comment. I especially like the ones with words that have letter that can be colored in. The ones being worked on are below. These cross rocks will have 1 Cross+3 Nails = 4 Given written across the front of the cross. A bunch more gold rocks will have “HE IS RISEN” painted across the front. I started the Rosie Rocks Facebook group almost one year ago and we now have 73 members. That means around 60 of my rocks that were found, the finder joined the group and posted a photo. If you’d like to join or see the rocks that have their pictures posted check Rosie Rocks out at https://www.facebook.com/groups/1707652262651874/https://www.facebook.com/groups/1707652262651874/ I’d say that photos of about 1 out of every 50 rocks hidden wind up on the facebook group. I would LOVE for all to be posted but at least I know that most all are found and hopefully they put a smile on the finders face and meant something to their heart! Sometimes we mean the person performs at a superior level. He is a good singer. 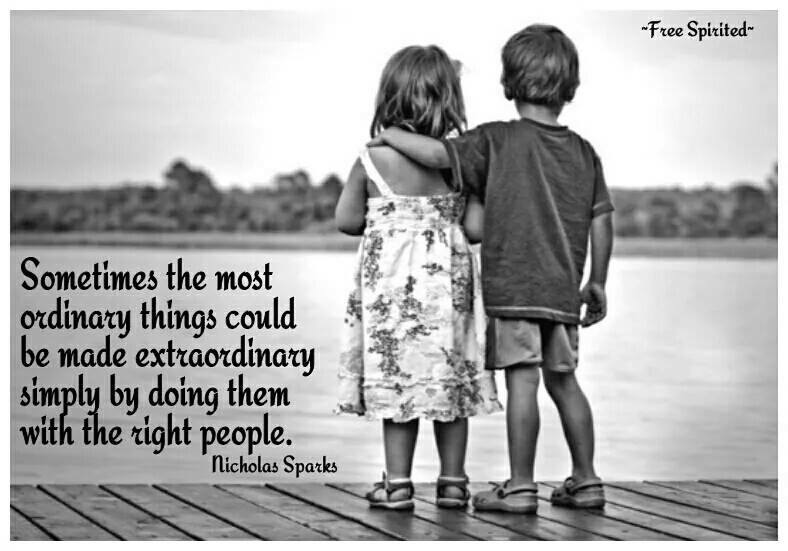 Sometimes we mean the person is kind. She is not harsh or cruel, but sensitive to others. Often we mean the person is morally true. This good person behaves in ways that are clean and right. Is this what we mean when we say God is good? 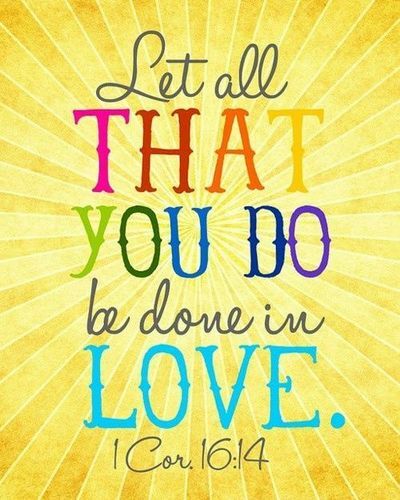 Our Heavenly Father is perfect in what He does, kind beyond our understanding, and morally pure. But these definitions of “good” yet fall short of the core meaning His goodness. The goodness of the Father is a profound care for wayward children that moves Him to pour out His life to save them in body, soul, and spirit. He is more than perfect in His acts, more than nice in His demeanor, more than morally pure. 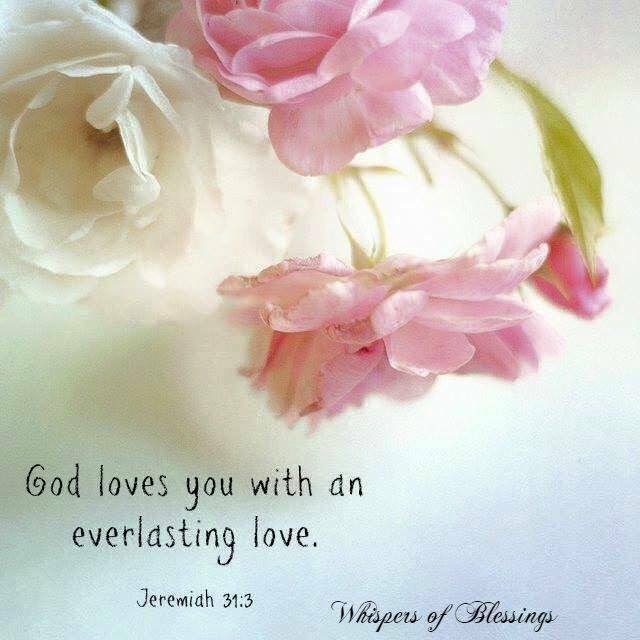 He is good because He infinitely and always pours Himself out for us. Rev. 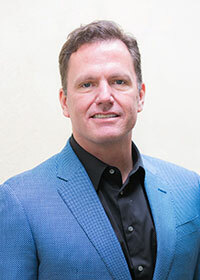 Bob Adams was our interim pastor at Trinity Baptist Church for two years. His ministry at our church was filled with so many blessings! It is an honor to share from time to time his quiet thought with ya’ll. Ya’ll have a Blessed Week and Yes, God Is Sooooo Good! I’ve said before that I wish these types of encouraging information for Christian moms was available back when I really could have used it while my sons were growing up. We did the best we could back then but had someone put this type of information before me I believe I would have been a better mom. I hope all the young Christian moms I know will read this. There are links within the article to other articles of hers about being a better mom. They are all great and I recommend reading those as well. What makes a good mom? If you ask 100 people this question, you’ll probably get 100 different answers.We often imagine someone who is always patient, available, and bakes cookies from scratch. Someone who never has emotional outbursts or gets irritated with her kids for making messes. The ideal standard is hard to live up to. And Christian moms face this pressure even more. In our quest to elevate the role of motherhood and encourage one another that it is a worthy calling, we’ve gone to the opposite extreme of equating mothering with sainthood. I can think of no mother I know who would even remotely qualify for this status. Because we’re all human. We’re imperfect, saved sinners just trying to do our best to raise children for Christ. The good news is that there is no way to be a perfect mom, but many ways to be a really good one. 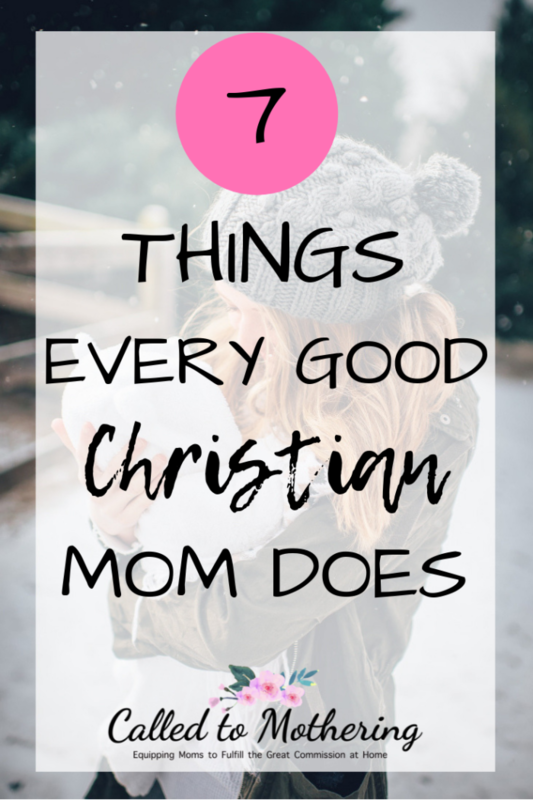 Here are seven things every good Christian mom does (and none of them involve baking). One of our most important and rewarding tasks as a Christian mother is helping our children grow in faith. It is so much more than just taking them to church on Sunday. We play a vital role in our kids’ discipleship because we are uniquely positioned to walk beside them daily in a close, loving relationship! Reading the Bible consistently with them and teaching them how to apply verses to their everyday lives is paramount to their own walk with Christ. We should also help them establish the spiritual discipline of prayer and Bible study for themselves. 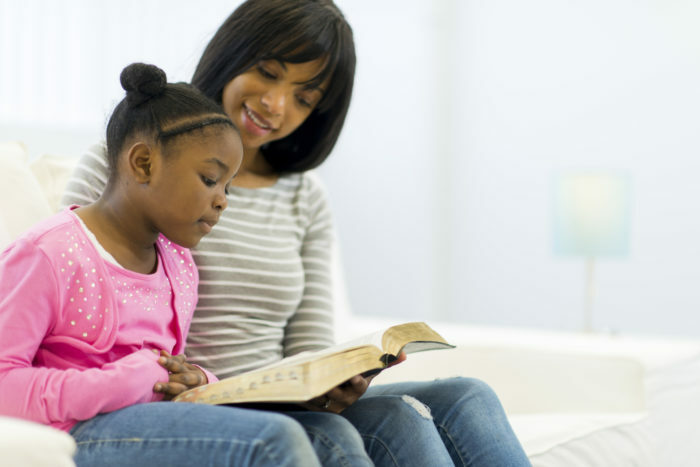 Using the Scriptures to correct them and teach their hearts to obey God as you “sit in your house and when you walk by the way and when you lie down and when you rise up” is key to your children’s spiritual development. The other day, I flipped through a book my son had borrowed from the library. Its first chapter introduced a main character that had several negative traits such as deceitfulness and pride, as well as a plot that contained some dark fantasy elements. After I talked through the themes with him and we read Philippians 4:8 together, he decided to substitute it with a better choice. As moms, it’s sort of our job to be nosy. It may not make us “cool”, but it will make us a great parent. We need to be aware of what our children are being taught, the kinds of media they’re consuming, and the peers they’re being influenced by. God gave us that “gut instinct” and we should listen to it! We have the power to influence and guide, and we shouldn’t allow culture to replace us. We often get discouraged at our shortcomings and flaws, believing that we can’t reach our children because these would make us seem hypocritical. The truth is, our failures can still teach our kids, because they reveal our need for the very Savior we’re teaching them about. They are also a great opportunity to grasp the meaning of “your grace is sufficient”. God can still be glorified, because when we admit we don’t have what it takes on our own to homeschool, or raise obedient children, or manage a home, God shows up mightily and we can give all the credit to Him! Being a good mom sometimes means recognizing that we can’t do this mothering gig all by ourselves. The sheer amount of daily tasks is overwhelming, especially with littles. And besides, God created us to be in fellowship for a reason: to bear one another’s burdens, spiritually and literally. Reaching out to ask a friend or your husband to take some of that stuff off your plate will allow you to decompress and relax a little. When you’re recharged, you’ll be a happier, more focused mom. Whether it’s getting up before the kids in the morning to do your quiet time, or after they go to bed, spending time alone with God is vital to your motherhood lifeline. We can’t pour into our kids day in and day out without being refilled by the Spirit. A good Christian mom recognizes her utter dependence on God for all the things that mothering requires of her. She knows that a habit of being in God’s Word every day will give her a renewed mind, as well as the fuel she needs to make it throughout the busy hours with her kids. One of our biggest responsibilities is pulling out the weeds of bad behavior, and it seems like a never ending task. As soon as you prune a few, others ones grow up right in the same spot. 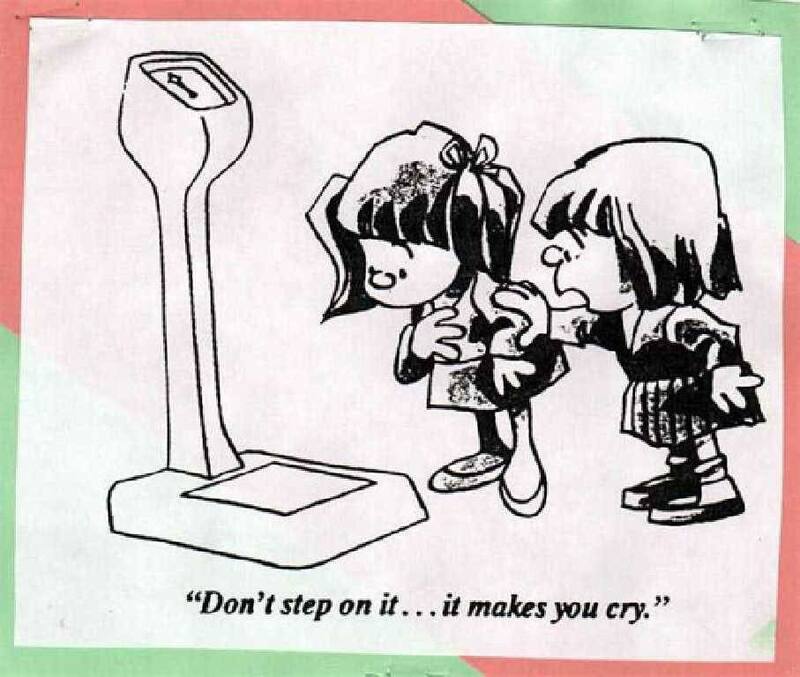 It can become discouraging, and sometimes we end up feeling like failures (see Point #3). But those behaviors and attitudes are actually excellent ways to point each child to Christ! When they keep disobeying and express in frustration that they can’t be good, we say “Yes exactly! That’s why Jesus came to redeem you by His death on the cross”. In those moments, we can present the Gospel very clearly to our children. Prayer brings God’s power and blessing to our kids’ lives, and it can lead them to genuine, godly repentance. It equips us to fight the spiritual battle for their hearts and minds, something the Enemy desperately wants to take over. We can influence and impact our kids for eternity by kneeling with them and showing by example that since we trust God with our concerns, they should too. When we don’t have all the answers, we can lead them to the One who does! Being a Christian mother is extremely hard. I made more mistakes than I ever want anyone to know about. I am now a grandmother and take that responsibility as seriously as I did being a mother. I don’t want to make the parenting mistakes I made, with my grandchildren. I want to be the kind of grandmother that takes seriously the points in the article above. You may no longer be a child’s mother but are now a grandmother like me. Our influence in their little lives must always direct them towards learning all about Christ. This quote below makes a strong statement. Children becoming strong Christians is the most important aspect we should devote our lives to as grandparents and parents. 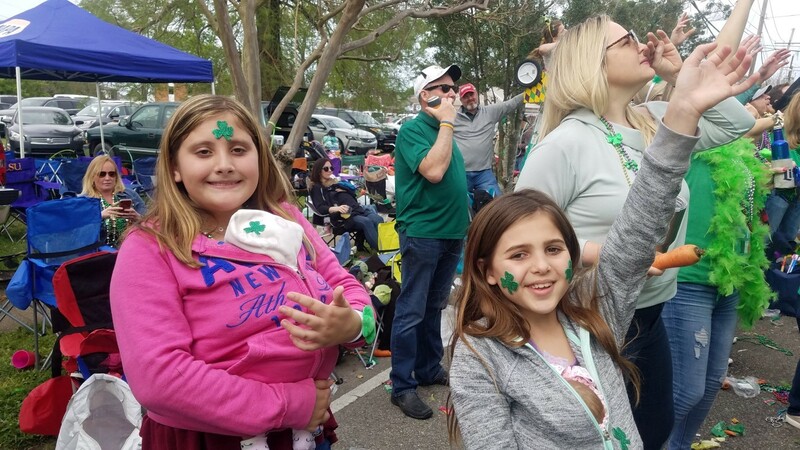 Founded in 1971, the St. Patrick’s Parade of Metairie has been taking to the streets of Old Metairie for over the past forty years! 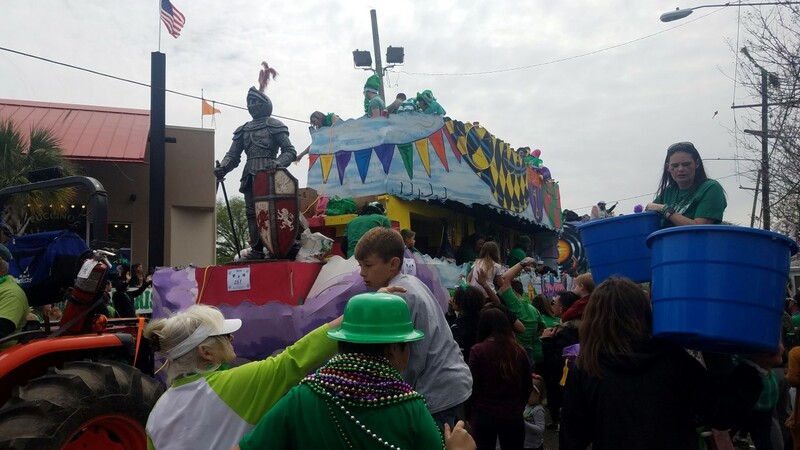 The parade consists of floats and trucks, bands, marching clubs, and all the carrots, cabbages, potatoes and beads you can catch! 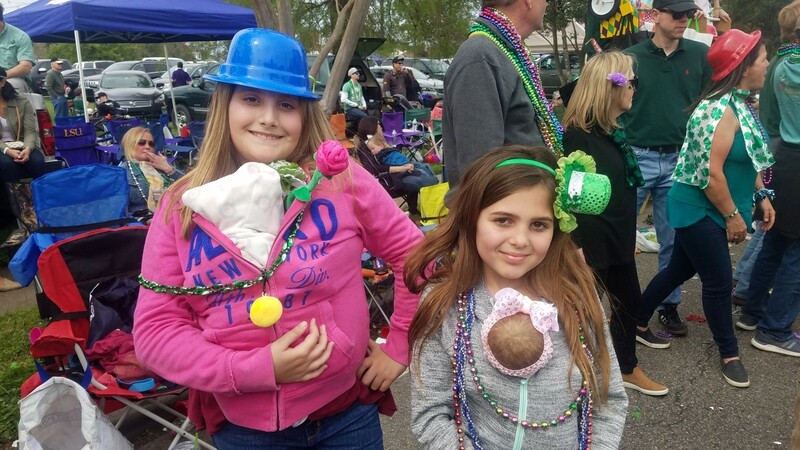 Our family has been attending this parade since before Roy and I were married in the early 1970s! 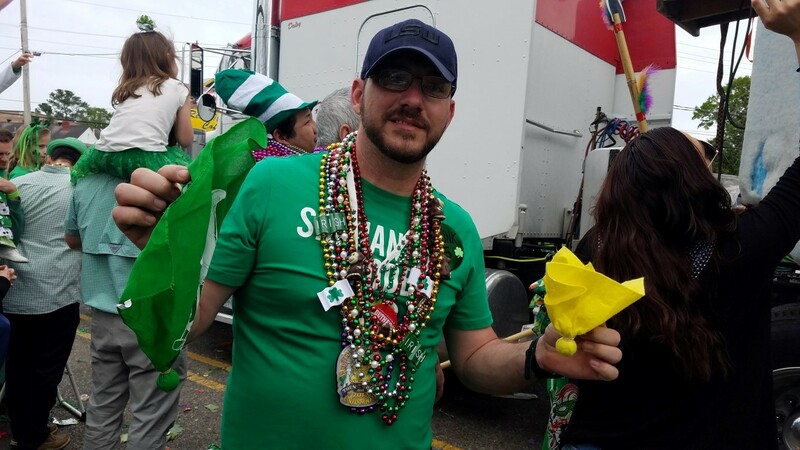 Roy grew up a block from Metairie Road and we’d all walk together, as a family, from his house to the parade every year. After Roy’s mom died we pretty much stopped going. A few years ago after we got Dora (our motor home) we began coming to the parade again. We parked Dora near the route and enjoying the parade with family and friends again. Dora’s gone now but I went with Chip’s family to Metairie Road after church Sunday morning. We missed some of the parade but still got to see around 100 floats! Roy’s niece Christy, her husband Otis and their son Zachary were there and we loved seeing them! Chip, Misty, their friend Carlos, Madisyn, her friend Cheyenne and me, Grannie, piled into Chip’s big SUV and headed for Metairie. Carlos doesn’t walk too well so Chip wanted to park as close to Metairie Road as possible. There were no parking spaces block after block after block. 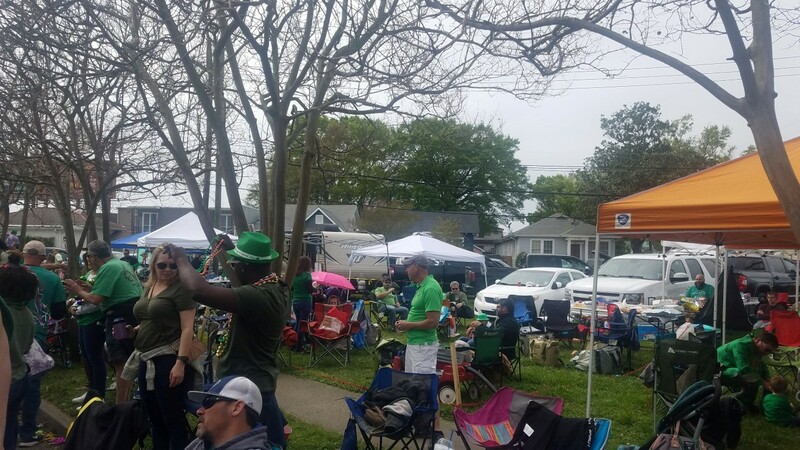 All the side streets were packed but somehow Chip managed to find a spot less than a block from Metairie Road. 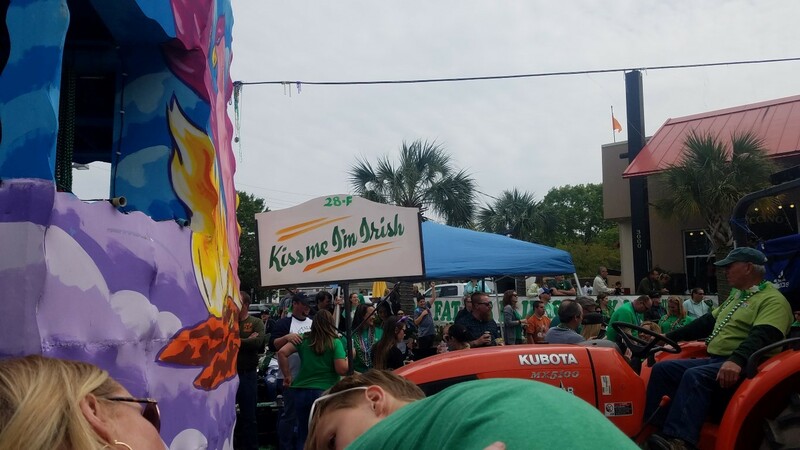 I’ve never seen so many people out there for the St. Patrick’s Day parade. This was an interesting set up. Children will sit on the bench on top of the ladder and can drop everything they catch (except a large cabbage) down the shoot where it will land in a big tub at the bottom. 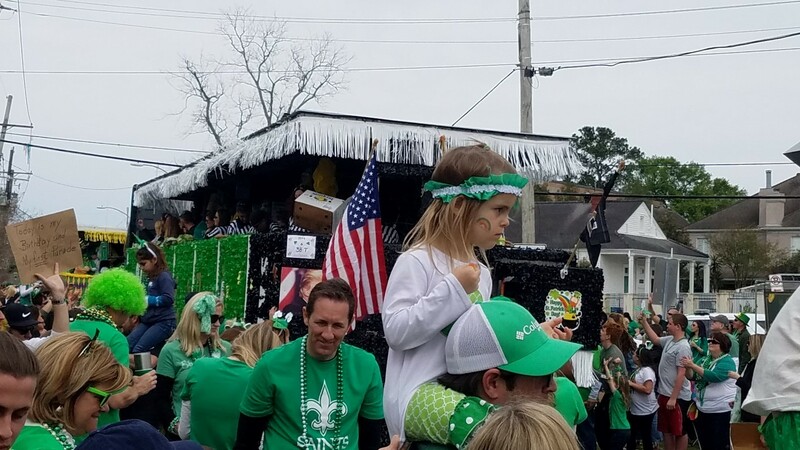 There was so much waving arms and catching food and beads, not a lot of pictures of the floats were taking ! Another new feature seen often at this parade were the big blue buckets in the picture below. They make an excellent large target for the people on the second floor of the floats to throw at! 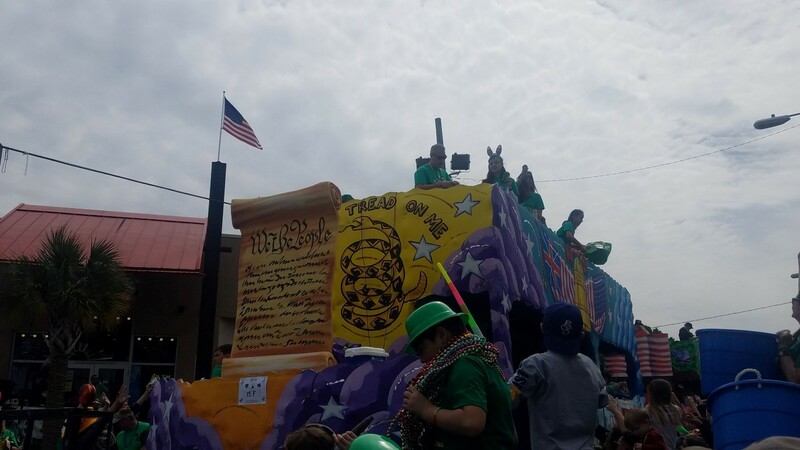 I didn’t get this photo taken in time for you to see President Trump’s picture on the back of this float with an American flag waving. I loved it. of course it was also a New Orleans Saints Football float! This young man caught one of the yellow referee flags that were thrown from some fo the floats. This was in reference to the “non call” that cost the Saints a spot in the Super Bowl. Yes, Louisianian’s never forget………………. I came home with 5 cabbage, 10 carrots, 12 potatoes, 10 lemons and some other snacks. Way, way less than last year. That was on purpose but when it started flying off the floats to us it was hard to resist getting more. I cooked all the potatoes and made potato salad with half and a cheesy potato casserole with the other half. I made unsweetened lemonade with half the lemons. Three of the cabbage were cooked and will turn into a cabbage casserole this week! Lots of yummy food! Ya’ll have a Blessed Sunday! 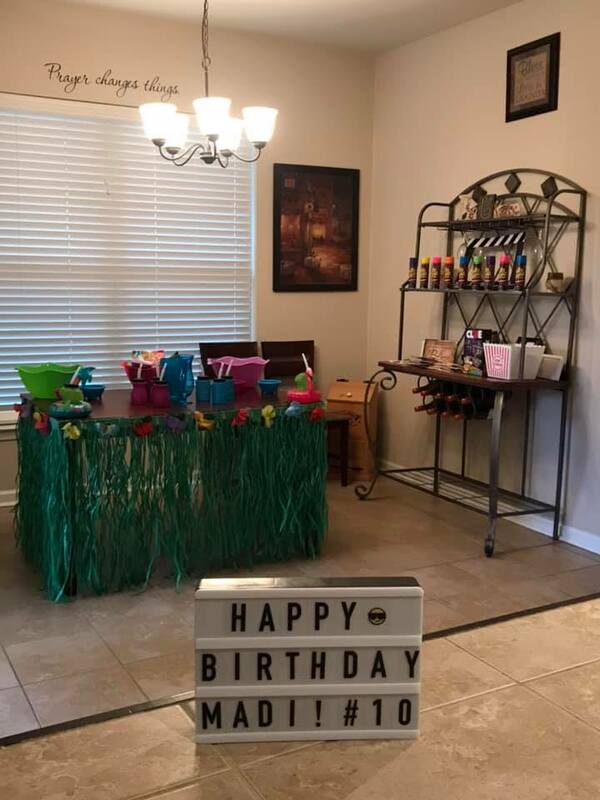 03.19.19 The Big Red Barn – Madisyn’s 10th and Kallie’s 18th birthdays! Our oldest grandchild turns 18 today! 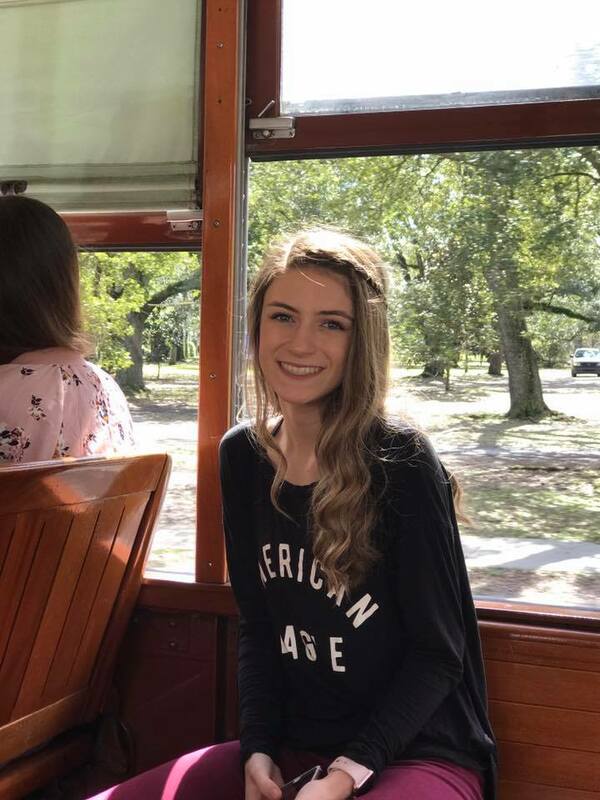 Happy 18th Birthday Kallie Barnes! Can’t wait to see how this beautiful lady rocks this world as an adult! 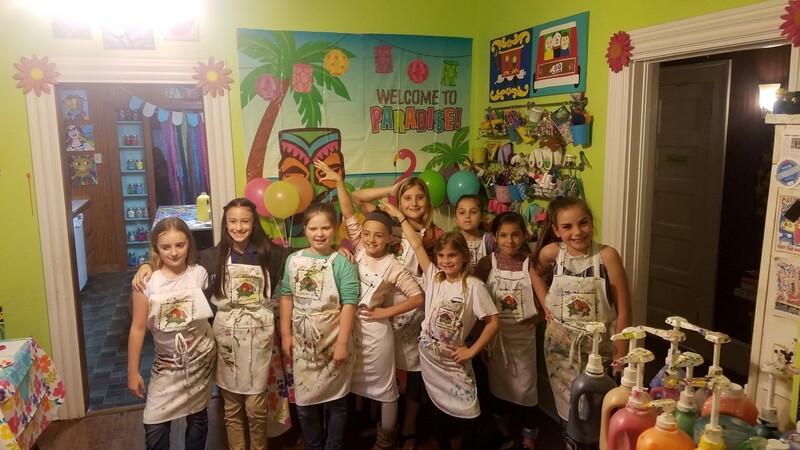 We just discovered the coolest, most adorable, fun place in Ponchatoula where we attended Madisyn’s 10th birthday party. 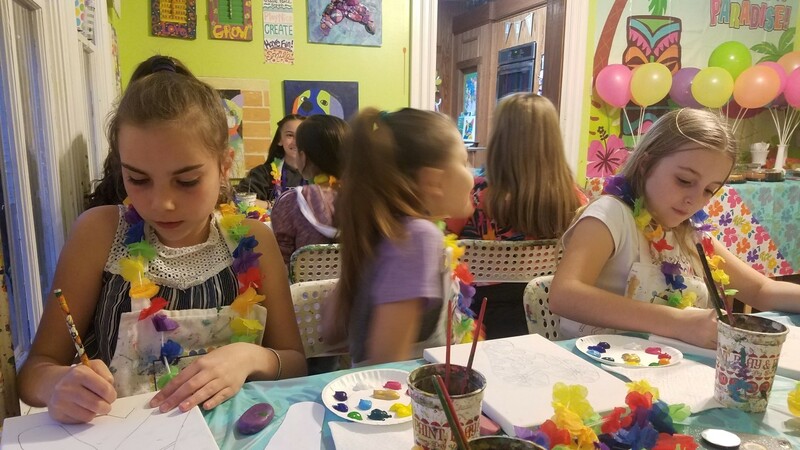 The Big Red Barn Creative Art Center is a perfect place for many different activities, parties, art classes, paint and play, art camps and sewing classes. If you have children or grandchildren this is a place you must take them to. I didn’t know it existed until we learned Madisyn’s 10th birthday party would be there. Now I’m wishing I was a 10 year old so I could go to all of the activities there. The brilliant young lady behind the Big Red Barn is Melissa Durel-Porter: artist, teacher, dreamer, and dabbler. Melissa (known as Ms. Missy) has 23 years in arts education for over 23 years. This experience includes dance, creative dramatics, visual art, and music appreciation. As soon as I met her I liked her! When you walk in the front door you are in her cheerful play room, filled with toys. The playroom is used for class discussions, stories, rug/lesson time, and free play. 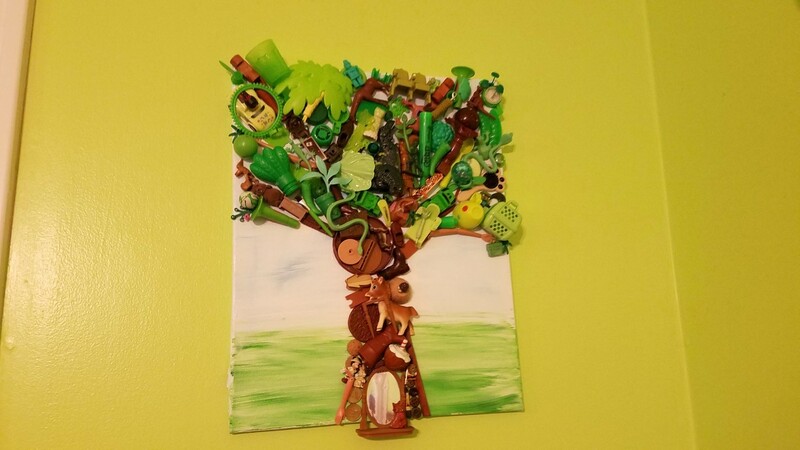 These two pieces of art made up of various miscellaneous objects create a tree and a pink flamingo! 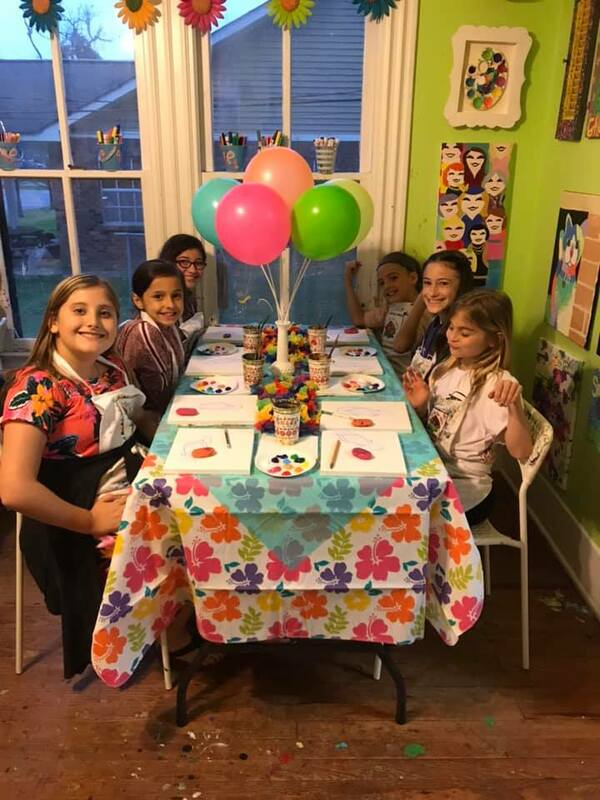 Through a pair of french doors is her art room where most of Madisyn’s birthday party took place. The room is filled with light and color and is perfect for all sorts of creative art activities. I am aware that I “may” look out of place with all those little girls but I can’t tell you how much I loved getting to paint with them. The library/lounge was a comfortable place where the children played and adults rested while the girls painted. 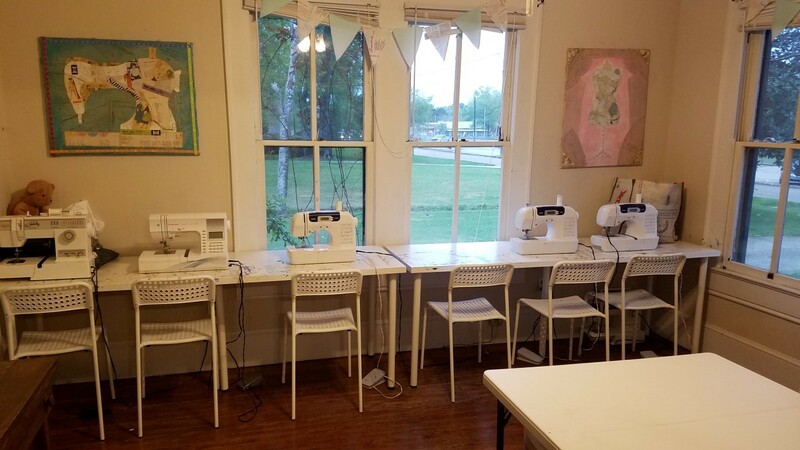 The sewing room has several sewing machines, tons of fabric scraps and vintage sewing patterns and notions. 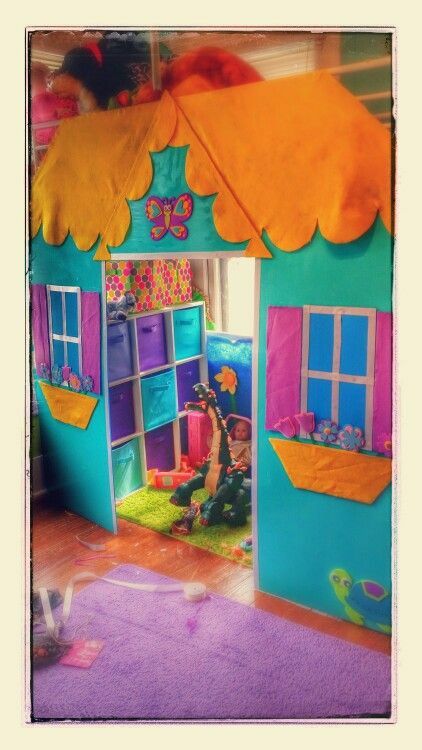 Another play room had doll houses, a tent play area and just about anything a child would want to play with. 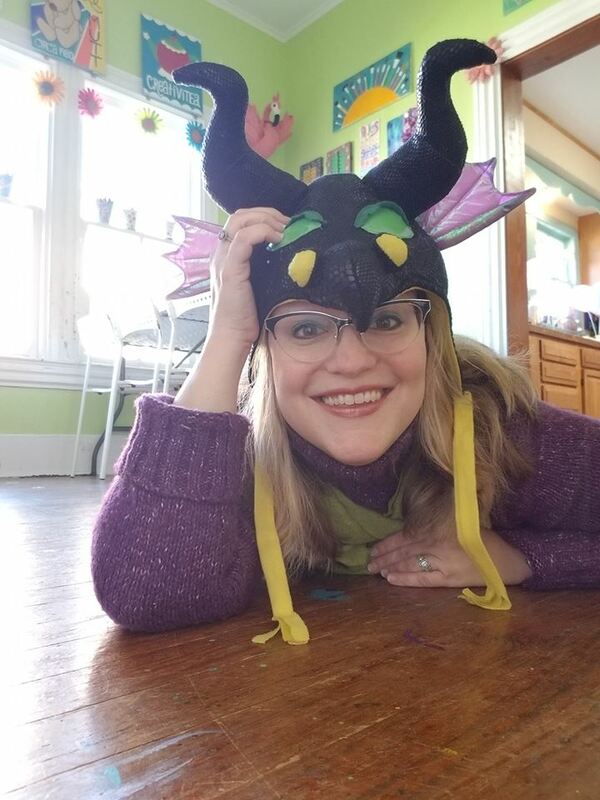 This blog post could be (but isn’t) very very long since there is so much to share about the amazing spaces she’s created at The Big Red Barn. Every square inch of all the walls are filled with creative art, art supplies, toys, etc. I throughly enjoyed being there. There are so many activities taking place there that the list would be very long. I’m going to stop here because her website and facebook space describe it all so much better than I could. 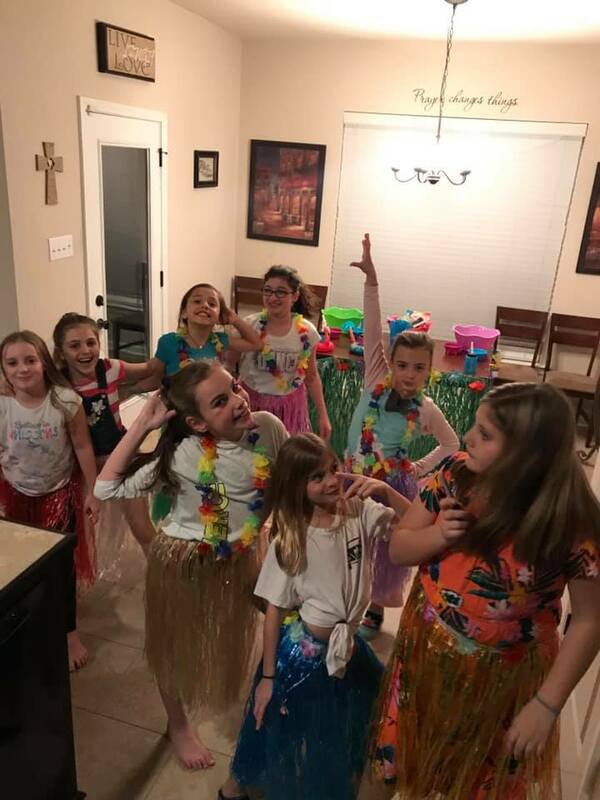 Madisyn’s birthday party there was fabulous. 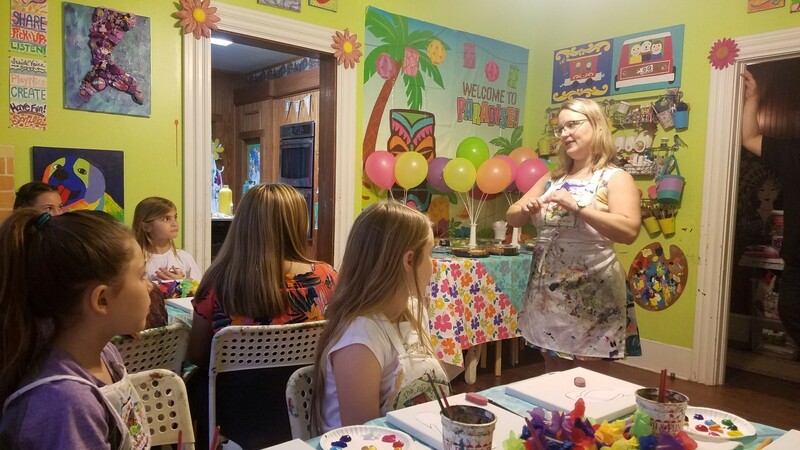 The party theme was Hawaiian luau and all things beachy so we started off by painting flip flops, sand and water on canvas with instruction from Ms. Missy. I say “we” because yes Grannie Rosalyn and 12 little girls participated in the painting. I loved it! One thing I thought was cool was that there was no “example” to look at. This was to let us be as creative as we wanted to instead of trying to copy the example. Chip and Misty provided pizza, fruit/vegetables and desserts. The girls and us sang Happy Birthday to Madisyn. 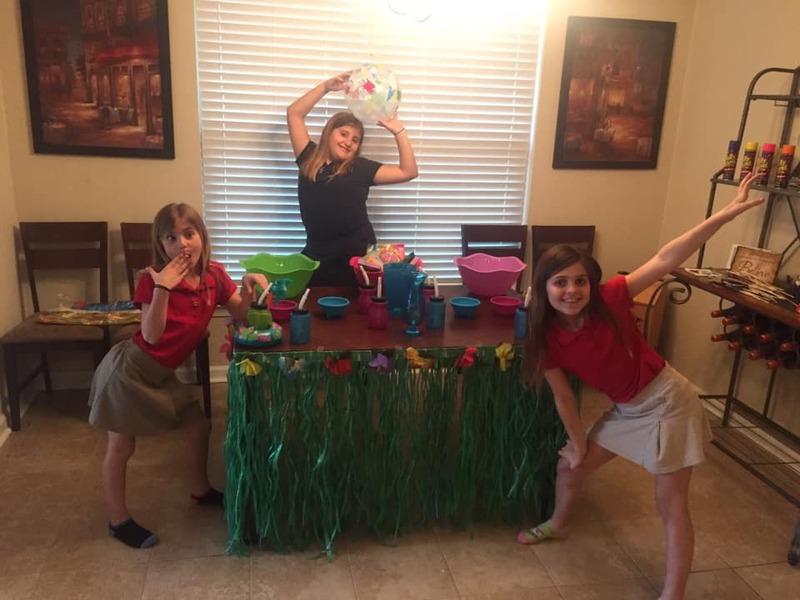 This is such a great birthday party idea and every one of the girls loved it. 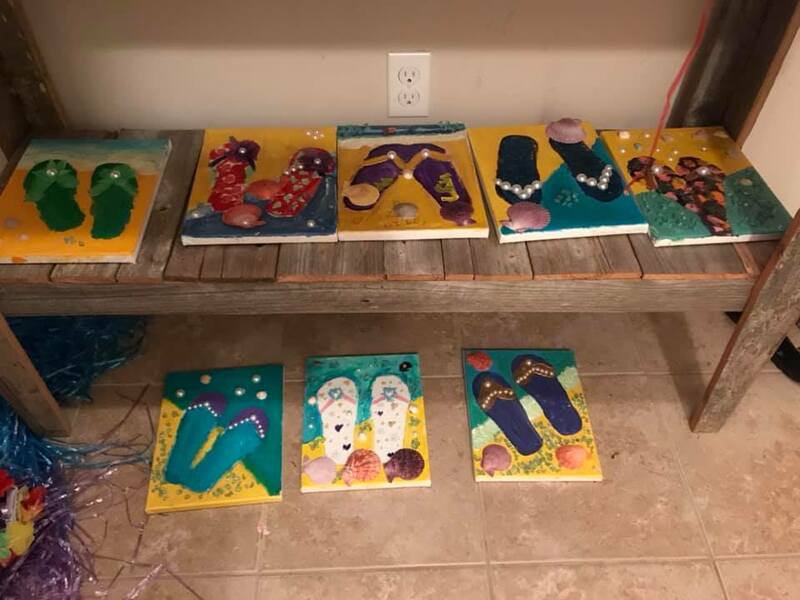 Here’s some of their flip flop creations! Madisyn had a big smile on her face the whole time and was a beautiful Happy Birthday girl! 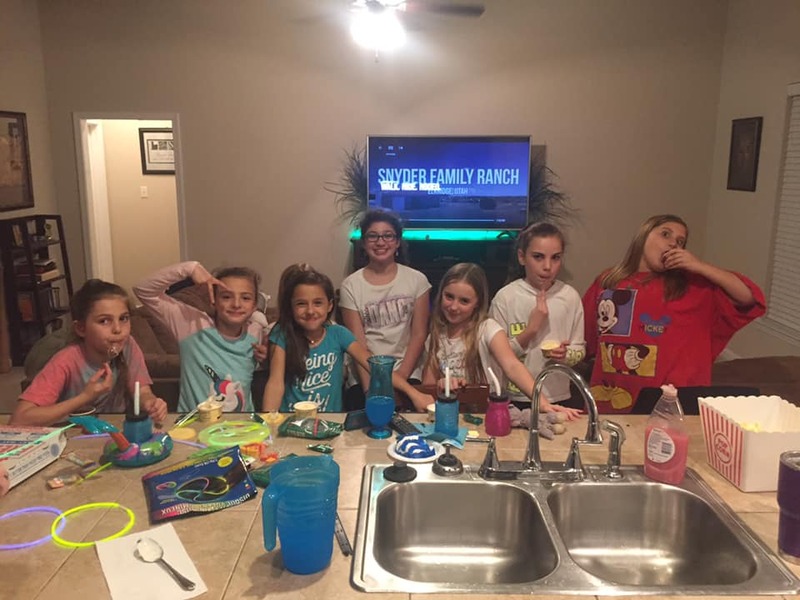 Several of the girls went home with Madisyn for a sleep over. We weren’t there but from the looks of the pics it was a great night which included getting made up by Madisyn’s big sis Kallie! If you like what you see here or on their website here’s The Big Red Barn’s contact info, 234 SE Railroad Ave, Ponchatoula, LA 70454, 985-373-0468. After all this fun on Friday night we rested Saturday. 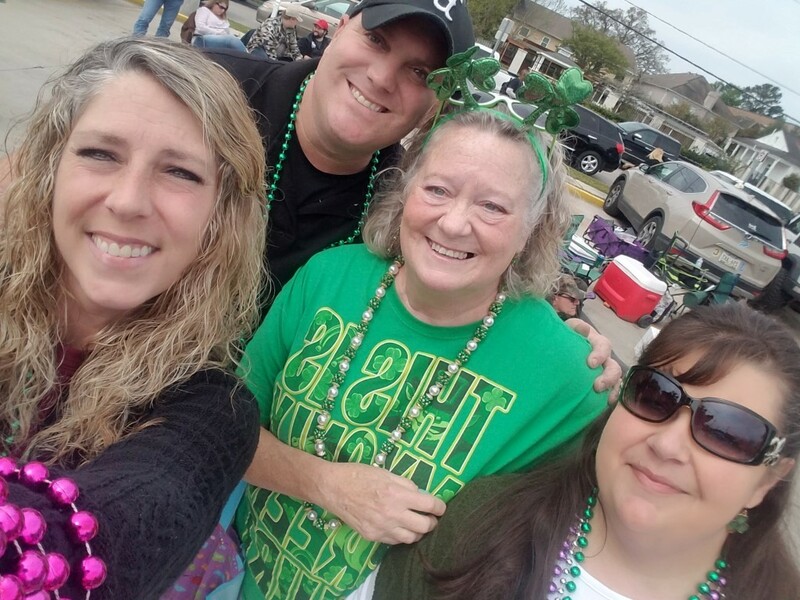 I went with Chip’s family to Metairie on Sunday for the St. Patrick’s Day parade! All about that in our next blog post! Progress is being made in the garden. A little bit at a time. This update is long and not all that interesting 🙂 I wrote it to help me keep track of how the garden is progressing and to look back on how this years garden was grown when planning the next garden. If you want to learn with us as we experiment with this spring’s garden read on!! If not, feel free to go outside and walk around a while enjoying God’s beautiful world instead of reading on! The three beautifully sprouting militon plants were planted in the garden on Thursday, March 7th. These lived on top of the refrigerator until they started sprouting and then they lived outside for the last couple of weeks except for the freeze nights. After just a few days in the ground they have already sent out their little feelers and curled along the wire! You see a little bit of the militon is sticking out above the ground. That’s how it is suppose to be for them to grow right. The end where the roots grow down and the vine grows up is below ground and the other end above ground. 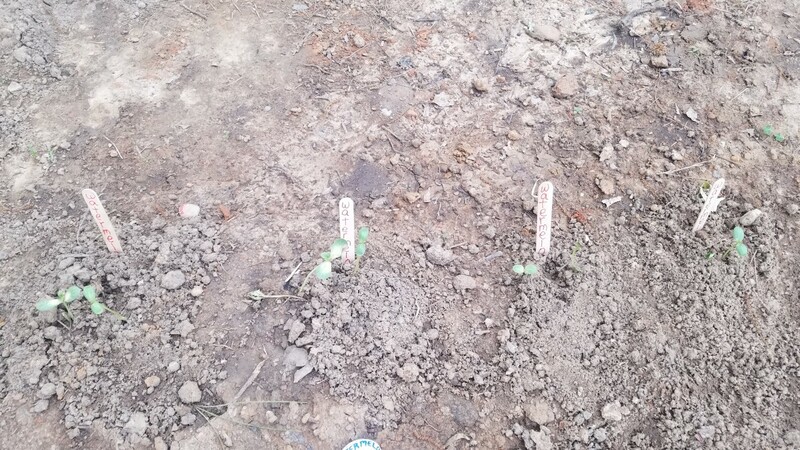 Two newer militons that haven’t sprouted joined the first three in the ground on Saturday, March 9th. 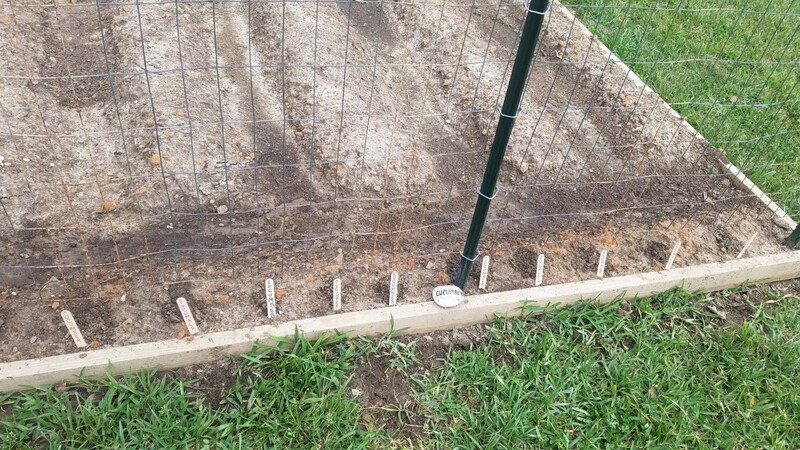 All five militons are planted along the wire Roy put up to give the militons and cucumbers a place to grow up. The cucumber seeds have not done well, unlike how well they did last year. With only 3 seeds sprouting I decided to plant 10 seeds directly in the garden on Saturday, March 9th along the same fence the militons are growing on. It looks like only sticks are growing there right now! The potatoes that have been growing outside in a large container were planted in the garden on Thursday as well. They sprouted and have been growing well outside in a pot, being moved inside when it froze. Two more potatoes are now cut in pieces with two eyes each waiting to sprout more and the outside hardening before going in the ground. Half of one row is now planted with garlic and the other end with yellow onions. The three garlic I started inside have sprouted well and were planted in the garden on Thursday, March 7th. Several more garlic cloves were planted directly in the garden on Thursday to see how that works compared to starting them inside and moving them outside when they sprout. One yellow onion set (tiny onions) was planted inside and sprouted really well. 12 yellow onion sets were planted directly into the main garden. Ten sets were planted in a big pot a week ago and are still there. 18 sets were planted in an egg carton two weeks ago and were transplanted (with good roots growing) in the pond garden. There are probably 40 onion sets left unplanted. Those will be planted during the summer. My efforts starting corn inside were pretty much a failure. Only one did well and was planted in the garden on Thursday. 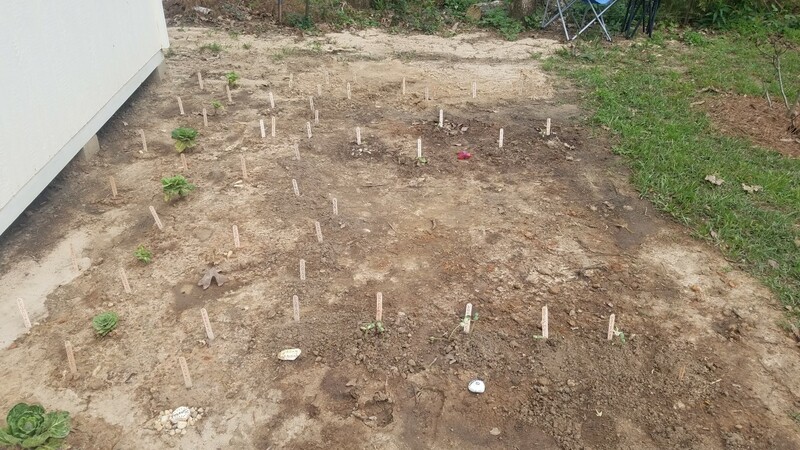 Around 20 corn seeds were planted directly in the garden on Thursday. More research showed that starting inside is not a good idea so now I know for future gardens. Here’s the garden with potatoes, garlic, onion sets, corn seeds, militons and cucumber seeds planted. Sprouted watermelon (Jubilee) plants and cantaloupe plants (from our own seeds) were planted into the garden down by the pond on Thursday, March 7th. Watermelon seeds of a different variety, Allsweet, were planted in the ground in a straight line in the pond garden. The three sweet potatoes were cut with two eyes on each piece. They were planted in an aluminum pan and were growing well in the pantry and have started to make leaves. It will be a while before the splits are ready to be removed and planted in the ground but for now they have joined the rest of the other plants outside of the pantry! 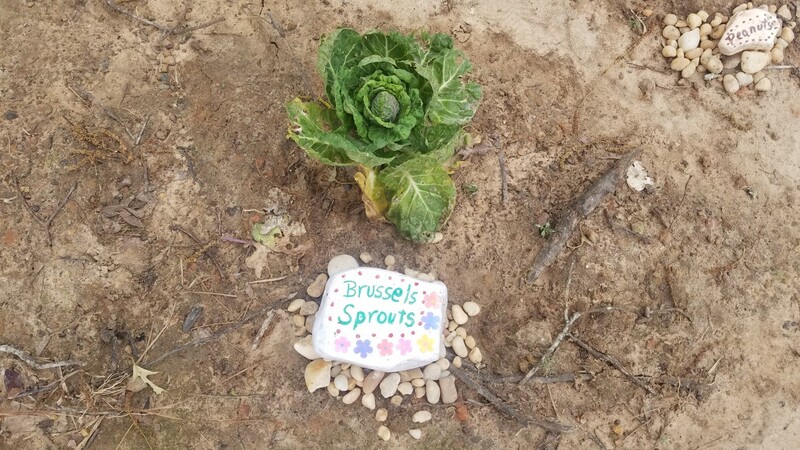 The brussels sprout plants were dug up from last year and were planted last week in the pond garden are doing well in the ground. When I planted them I saw tiny little brussels forming along the stalk. 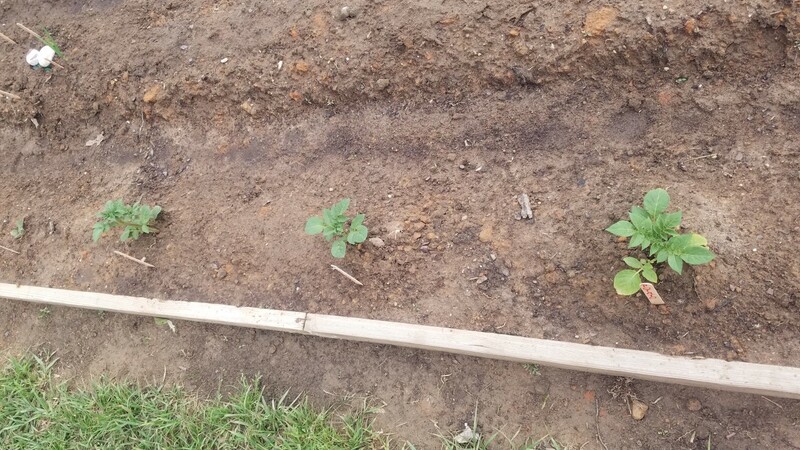 Between 12 and 20 peanuts were planted near the Brussels sprouts last week but nothing is sprouting yet. 10 peanuts were planted in the flower garden along the fence near the front of our property. Peanuts don’t require much care so I am planting them wherever there is an open space! This looks like pretty much just a bunch of popsicle sticks but there really are some small plants there! The seed plantings that are not ready to plant outside are spending a couple of hours outside each day hardening them. They are in a protected environment inside the kitchen which is drastically different than outside conditions. Spending a bit more time each day outside in the elements help prepare them for when they live outside all the time. I didn’t do any of that last year. The seeds were planted in their little individual spaces and lived outside the whole time. Today is day 3 of their hardening process. 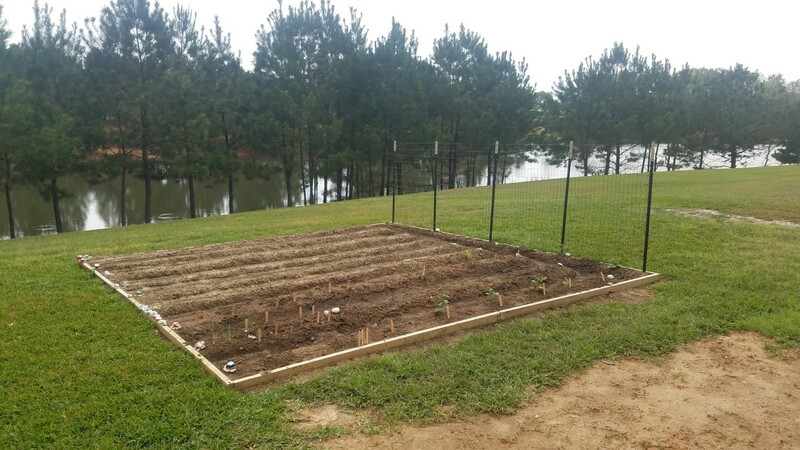 The seed plantings going through hardening right now are the bell peppers, cherry tomatoes, big tomatoes, okra, green onions, eggplants, cauliflower, broccoli. All of them have 3 or more leaves on them and just need the hardening. The beautiful leaves sprouting on our two fig trees froze earlier this week but there are new ones sprouting out already! The eight blueberry bushes are all sprouting new leaves and blueberries. Some bushes more than others, but they all seem to have survived the big transplant last year! While gardening is a very fulfilling experience it has frustrated my brain this week. I thought I had some safety net things in place to help me remember what’s planted where. However, I planted some seeds in two containers and before I could make markers to identify what they were I forgot what I planted. Didn’t even stay in my brain 10 minutes. I had to dig them up to figure it out. I have several small pots with cucumber markers in then that I don’t really know if there are seeds in there. Nothing is sprouting yet so there probably is just dirt but I’ll give it a bit longer hoping I did actually plant seeds in them. My sweet honey Roy saw I needed more popsicle sticks for identifying plants as I’ve used all I had (sorry Madisyn, they use to be yours in your craft box!) He went to the store and bought me over 100 large wooden (popsicle like) sticks so I could write on both sides what the plant is to put one next to each one as I plant them. There are now popsicle sticks all over the gardens. Last year I painted rocks with the names of each vegetable. Because I don’t remember what a plant is without seeing it’s name I painted a second one for each vegetable this year to put one at each end of the row. I am finding that while I’ve done a lot of research about all of the vegetables I don’t remember most of it. I made a spreadsheet with lots of the information to help me with that. But I have to remember to update the spreadsheet for it to be helpful, I haven’t updated it in a month. In this picture I am moving sprouting onion sets from the egg carton I started them in. They are now in the pond garden where I am hopeful they grow into full size yellow onions. Had to shake my head when I saw what an old biddy I look like in the picture but that’s me when I’m crawling around in the dirt! I require a shower and clean clothes every time I do that! Well that’s it for gardening by the Chauvin’s this week. More will be transferred to the garden next couple of weeks, I hope. Today the high temperature was 80. We had a delightful visit at our house with my sister Harriett and brother in law George and I got to show her all my gardening efforts!